A post without plants?? Hard to believe, I know, but I thought I'd share my experience with a fellow etsy seller, PixiePotions. She contacted me with a trade, and I checked out her shop and found some things that I was interested in. We agreed to the trade, and I sent out my box. I got the box from her quickly and well packed. The products are all very professionally and functionally packaged, which immediately caught my eye. The lotion stick is very cool. It makes putting on lotion easy, and I don't have to worry about getting my hands oily or greasy. And the scent! 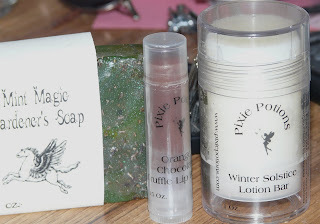 The Winter Solstice lotion stick has an amazingly earthy, spicy smell that is almost dominating. I have it next to me, right now, and can't resist opening it, every now and then, to get a sniff. I couldn't pass up the Orange Chocolate Truffle lip balm. I knew I would love it when I picked it out, but I didn't realize quite how luscious it would be. Another yum! It smells like chocolate with a hint of orange and has a great texture. It's light but does it's job with tastiness. It leaves a darker sheen on my lips than most of the lip balms I've used, too. Everyone I've let sniff it has said 'Wow! That's chocolate!' She states in her description that it's 'made with real fair trade dark chocolate', and, boy, can you ever tell. Definitely a must for any chocolate lover. The Mint Magic Gardener's Soap was an extra she threw in, but it's something that I'd definitely buy. The scent is fresh and soft -- very refreshing and soothing. It's got a lovely, silky texture and gives a really nice lather. Wow that lip balm sounds so yummy! I am off to check her shop out. Thanks for sharing! Also thanks for stoppiing by my blog!